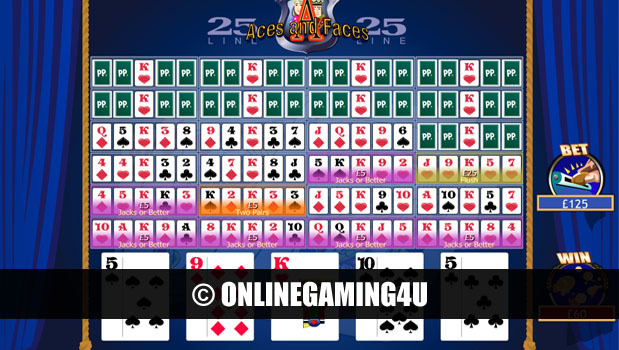 Aces and Faces is a slick variation of online video poker where the focus is on the hot shot ace cards and picture counterparts. Players can engage in some exciting video poker action with Aces and Faces that features gripping gameplay and fantastic payouts. The game offers 25 lines per round of betting with the chance to win some amazing prizes. The main mission in the game is to get the very best 5 card poker hand that contains a winning combination of that on the pay-table. Each line in the game uses a different deck of cards and is treated as a separate hand giving maximum chance to win. The table containing the payouts can be viewed at any time and used to make your decision on betting on each round. Players can vary the stake they choose to play with on each game round. Start with a 5p stake on one round, then select a 10p stake on another. The possibilities are endless with Aces and Faces. Minimum stake for this game is £0.05 and maximum is £10.00. An example round of betting is to select a stake of £10 and ‘bet max’. On a hand that matches 2 pairs on all lines and hands wins £2450 in one round of betting. At the end of each round of betting per game; players have the chance to double their winnings in a built in mini game. The game is a quick fire round of “higher or lower” but without the lower. Players can choose to risk half of their winnings and double that or go for an even bigger payout and gamble the round-winnings to double the lot. The double-cash limit is set at £2000 so anything near this and the mini game will be suspended. 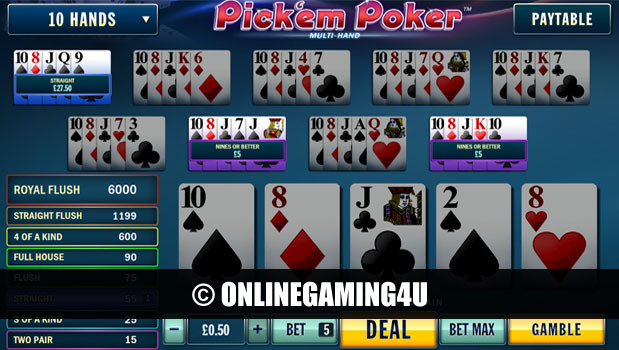 In this event players simply collect their winnings with no gamble option. During a game round, players will be paid out on a minimum of pair of jacks or better. The better the poker hand the more you will win. An Aces and Faces royal flush hand is the absolute best that any one player can have.